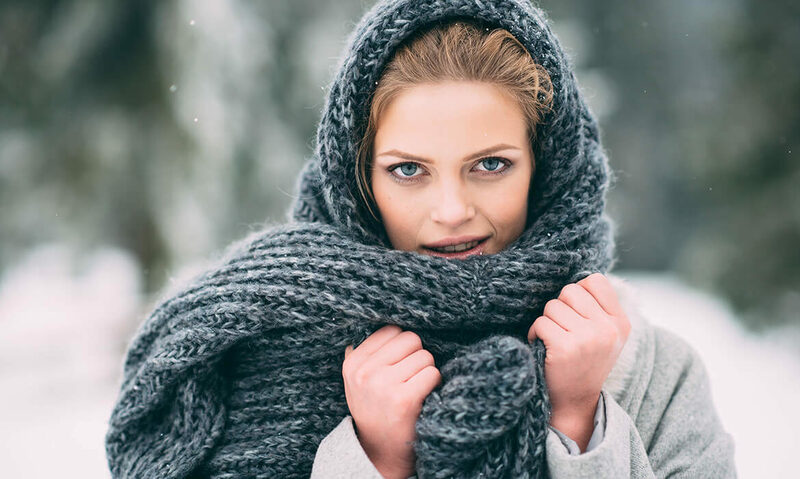 As winter makes its grand entrance, you may have noticed your skin going through some changes. During the colder months, it’s natural for your skin to become drier. The reason for this is that your skin’s lipid barrier becomes compromised. This protective lipid barrier, or hydrolipidic film is comprised of sweat, sebum, and water. When the air becomes dry and the temperatures drop, this protective barrier begins to deteriorate. Your skin becomes more porous and moisture evaporates more quickly, leaving it parched and prone to cracking. To counteract the effects winter has on your skin, we’ve compiled the ultimate guide to help you take care of your skin and prevent it from becoming dry! It’s time to skip the foam cleansers and swap them for cream cleansers! Foam cleansers often contain harsh surfactants, such as sulfates, that strip your skin of its natural oils. Instead, opt for a gentle cleansing milk to preserve your skin’s delicate lipid barrier. Many makeup removers and makeup wipes contain alcohol, which can further dry out your skin. If you wear makeup on-the-daily, removing your makeup with an oil based makeup remover is your best choice to save your face from dry winter skin! If your skin is already beginning to flake, you may consider light exfoliation. But be careful not to make things worse! Avoid physical face scrubs, you know, the ones that contain harsh granules! Instead, try a chemical exfoliant which can be less irritating on your skin. A lactic acid (AHA) formula will offer mild exfoliation for your skin plus has hydrating properties that your skin will also benefit from! You see all the celebs sporting them on their flights as they jet set around the globe. Those eery-looking sheet masks can be fun to use and are the perfect way to add hydration back into your skin. There are so many different toners on the market today! There’s literally a type of toner for every skin type! Whatever toner you do choose, just make sure it’s alcohol free. Many toners contain alcohol, and that is no good for dry skin. During the winter, you layer your clothing, right? Well, just as you would layer clothing, also layer your skincare! It needs those extra protective layers to prevent moisture loss and dehydration. An antioxidant serum can be layered under your favorite face cream for added protection against free radical damage and for its anti-inflammatory properties which can help relieve dry cracked skin. The skin around your eyes is especially fragile. It’s best to use an eye cream during winter, even if you feel like you’re ‘too young’ to use eye cream! Choose an eye cream that contains peptides. Peptides encourage collagen production and help keep your skin plump, supple, and hydrated. The key to having soft and hydrated skin is to inhibit moisture loss. The best way to do this is to choose skincare that contains the right ingredients. One ingredient in particular, hyaluronic acid, has moisture-binding properties – meaning that it attracts water. It is said that hyaluronic acid can hold up to 1000 times its weight in water! Now that’s an ingredient you need in your skincare! Another ingredient to look out for are ceramides. Ceramides are lipid molecules that help seal in moisture. Choosing a face cream formulated with ceramides will help improve lipid barrier function and prevent your skin from becoming dry. Your lips don’t produce sebum, which means they are prone to dehydration. During the winter, it’s vital that you protect them by using a moisturizing lip balm at all times. Aside from changing your skincare routine, you have to take into account certain external factors that may be contributing to dry skin. Indoor heating can cause the air to become uncomfortably dry. Using a humidifier can add moisture back into the air and help prevent your skin from becoming dry. Another thing to consider is the temperature of the water you use while showering. In the winter, shower with warm water to avoid stripping your skin of its natural oils and to preserve your skin’s lipid barrier as best as possible. Next, you must also feed your body the right foods. To keep your skin hydrated and soft, a diet rich in healthy fats is essential. Foods such as avocado, walnuts, and olive oil can provide the necessary fats your skin needs in order to be healthy and vibrant. Lastly, hydration is the key to having glowing skin! Drink plenty of water during the day to maintain adequate moisture levels within your body!